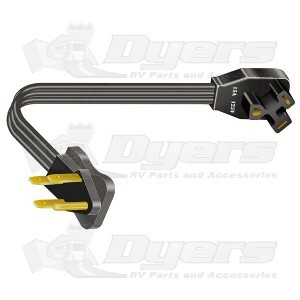 Heavy duty park adapter plugs into 50M amp park electrical box and 30F amp power cord from motor coach. New easy finger grip on both ends of adapter, and 10/3 gauge wire. Is this product even UL listed. How can you even find it safe to plug something rated at only 30A into a 50A outlet. The available fault current would fry a 30A line before the breaker would trip. The only right way to do this would be to include a 30A inline breaker in this cord just like the 30A-20A generator cords have. Don't fry your RV or risk your life with this one!